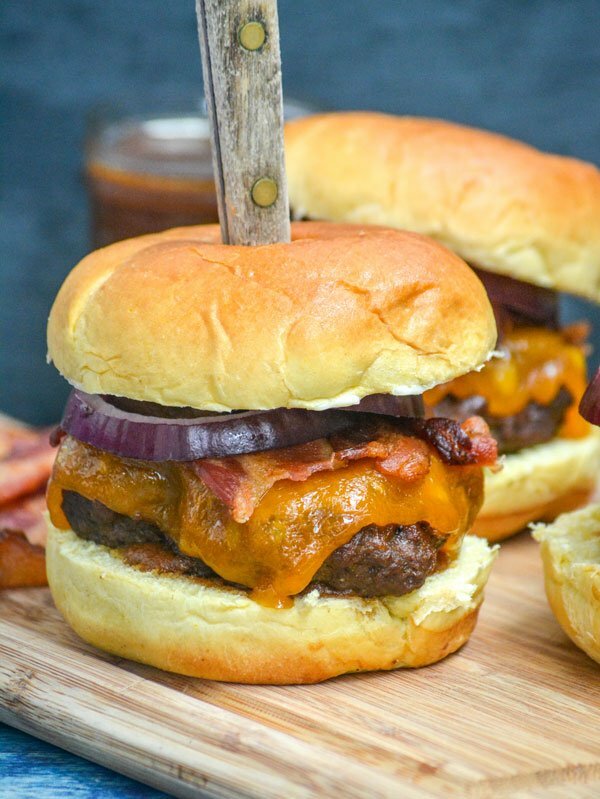 It’s hard to beat a good cheeseburger, but these Pineapple Barbecue Sauce Smoked Whiskey Bacon Cheeseburgers are simply the best we’ve ever had! 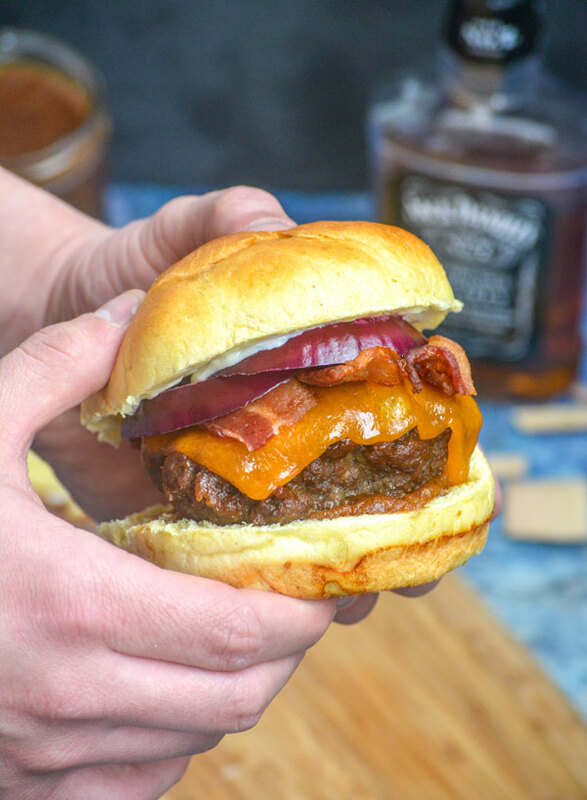 Whiskey infused, tender, smoked burgers are topped with thick slices of cheddar cheese, bright red onion rings, and basted liberally in an easy sweet & savory whiskey-based barbecue sauce. Sandwiched between pillow-y buns- it’s a burger to beat all other burgers. 12 years ago when the hubs and I got together, smokin’ hot had a whole different definition, lol. Nowadays, anything smokin’ can automatically be assumed to be a reference to our smoker and a giant hunk of meat. Unless it’s date night, then all bets are off and it could quite possibly be a dual reference. This long in the game, and you gotta keep it hot and keep your partner on their toes! So while we use our smoker fairly often, it’s always my go-to for a meal for the Hubs when it’s a special occasion. Time and time again it hasn’t let me down. Like really, I can’t seem to go wrong with anything that comes outta that thing in his eyes. Some of his favorites include my smoked, stuffed, whiskey-infused meatloaf, our extra creamy smoked mac & cheese, and these savory, smoky chipotle maple chicken breasts. So I’ve been recipe testing for Father’s Day, and have come up with the perfect burger for Dad for his big day. The hubs happened to come home early one day, and managed one leftover bite and practically begged me to make him whatever this magical, mystery burger was. Little does he know, good things come to those who wait! Pineapple Barbecue Sauce Smoked Whiskey Bacon Cheeseburgers. That’s been the sons’ and I’s secret project. Just because we’ve kept it underwraps from the ultimate 4 Sons’ taste-tester, don’t be fooled- they are amazing. So good, I don’t even have enough adjectives to describe them, good. 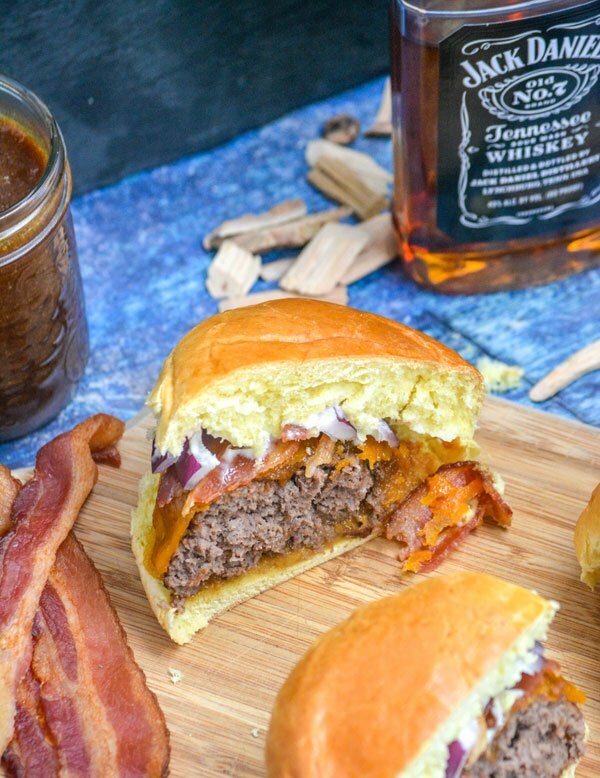 This smoked burger is basted in a sweet, whiskey based barbecue sauce- which almost takes it next to godly-ness taste wise. This simple, but savory sauce features so many different flavor levels that blended together are seamless. We’ve got (obviously) Jack Daniels whiskey, pineapple juice, brown sugar, molasses, lemon juice, garlic, ginger, and soy sauce. Just to name a few. Blended to smooth perfection, this mixture is mixed into the burger patties, before being basted on top of the smoked burgers. 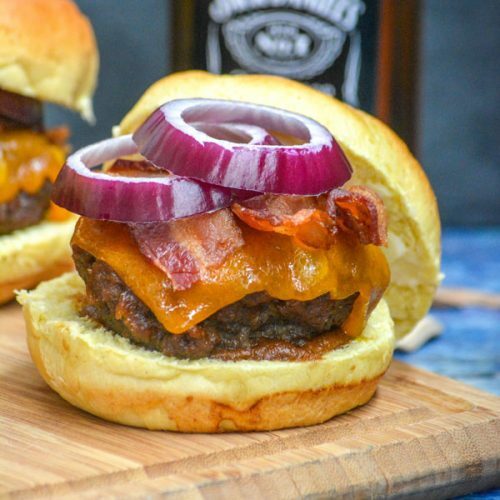 Smoked until a perfect light bark is reached, these fat, juicy burgers are settled onto pillow-y buns, topped with thick slices of cheddar cheese, crisp bacon, and rings of red onions before being drizzled with the pineapple whiskey barbecue sauce, topped, and served. If you don’t like, or want, mayo on your buns but want a little sauce- smear a little of the sauce onto the inside of each bun for moisture. Otherwise, you can spread with softened butter, toast, and use as directed. 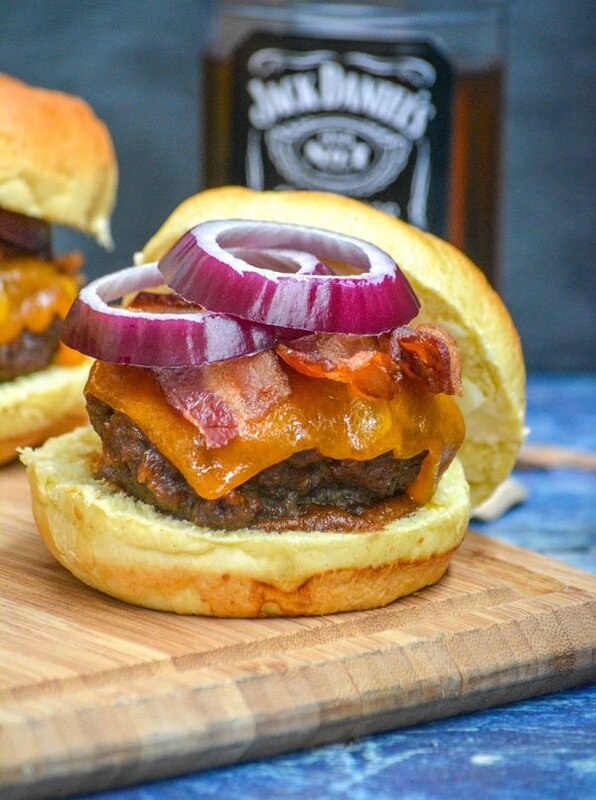 Everything you could possibly fit into a single, hearty burger- these Pineapple Barbecue Sauce Smoked Whiskey Bacon Cheeseburgers are the perfect way to say Happy Father’s Day to the special men in your life. Other smoked recipes you might enjoy: Smoked Beer Brats with Caramelized Onions, Cherry Coke Smoked Pulled Pork Barbecue Grilled Cheese, and Dr Pepper Jalapeno Smoked Beef Jerky. A hearty, extra thick burger this smoked whiskey version is slathered with a sweet homemade whiskey barbecue sauce, then topped with slices of melted cheddar, red onion rings, and crisp slices of bacon. To a large skillet over medium/high heat, add the water, pineapple, soy sauce, brown sugar and molasses. Whisk together and bring the mixture to a boil, stirring occasionally, and reduce to a simmer. Stir in the remaining ingredients and let the mixture simmer for about an hour, stirring occasionally. Set the mixture aside, let cool. Transfer the mixture to a blender and puree until smooth. Add the ground beef to a larger mixing bowl. Add the allotted barbecue sauce, the whiskey, and the steak seasoning. Using your hands, mix together until completely incorporated. For the mixture into a log. Divide the long into 4 equal portions, and squash each one into evenly sized patties. Add hickory or mesquite chips to your smoker, and set it to 250 degrees. Place the patties onto a tin foil pan with pinholes poked in the bottom, making sure to place a pan underneath to catch the drippings. Using a silicone brush, baste the burgers liberally with the barbecue sauce. Place the burger pan into the smoker directly above the intended drip pan. If your smoker has a liquid pan, fill with water. Cook the burgers until an internal meat probe reaches 155-160 degrees. Using some of the remaining sauce, spread some on the insides of the buns. Add a burger to the bottom of each bun. 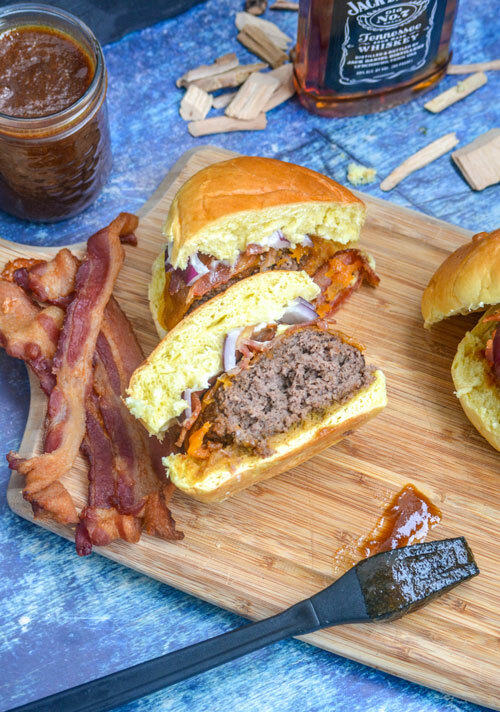 Top with a thick slice of cheddar cheese, several slices of crisp bacon, red onion rings, and finally the barbecue slathered top bun. Sounds like a yummy taste combination, that BBQ sauce! Thanks for sharing with Fiesta Friday! This burger is right up my alley! I love the flavor combinations 🙂 Thanks for sharing on the Celebrate 365 Blog Party! Aww, thanks for including me and for hosting!